I am currently considering this boat circa 2000 and would like to hear from current or former owners. I would be looking at one with diesels but welcome any comments. I like the quality and seaworthy reputation of Formulas but want to confirm that. In no particular order I am interested in any info on fit/finish, ride in seas, accomodations, engine/mechanical access, known problems and anything else you might want to throw in. There seem to be a number of these boats available which leads me to believe they were pretty popular. The 41 pc is a very popular boat. Diesels are definitely the way to go. Mannmade has one, and he is the moderator of this forum, so I'm sure he will chime in. Fit and finish are second to none. My 41PC is a 1997 and a close friend just bought a '98. Other than some cosmetics and decor they were unchanged through 2003. The fit and finish is supurb, and you will find that most if not all of the hardware is top-notch. Although this boat only displaces about 18k , the relatively steep deadrise (18 deg.) makes this boat cut through the chop. There is no "shudder" when encountering a large wake or a stiff chop. I'm not running offshore, and I do have gassers instead of diesels, but power really isn't an issue. Top speed would be about 30kts., but the best cruise for me is around 21kts. I think the Cummins run about a 25kt. cruise with a 36kt. top end. No known problems or mfg. defects. I have never heard of bad stringers or blistering issues with this model. The engine access is supurb with the main hatch open, but you can easily access all the strainers and check all the fluids easily through the day hatch. The shower sump pump can be difficult to access, as well as the back side of the genny, although the front of the genny is very accessible. The large cockpit, generous sized dinette and overall Formula quality (our 3rd) sold me on this boat. I am not dissapointed at all in any aspect of this boat, and after 12 years it is still a head turner. Good luck, and I hope this info was helpful! I used to help Formula sell at shows, etc in the Northeast. The 41PC is still my favorite model in the line. So well laid out and built like a tank! Tough to go wrong with it. I know you were looking at a 1999 41PC, & cheaper is better, but what is your budget? Thanks for all of your input. I really appreciate it. As for budget, part of the deal is I have to get rid of my boat. So I'm biased towards someone taking mine in trade plus cash. I have found a couple of willing candidates. All in, I'm probably looking at boats that SELL for around 100-110k. (My boat plus 70-80k max) So I've been looking at boats listed between 120k and 150k. The 1999's seem to fall in that range and the 2000's seem to be higher. One thing I noticed is the older 41pcs, pre 1999 have white cabinets. The 1999's and higher went to maple or cherry. Seems to give the boat a much more contemporary look. As to your question in another post, space is important as I have four kids plus my wife. My oldest is 10. As they are growing, the accomodations are becomming very cramped for sleeping. Also, it's becomming difficult to bring a sufficient amount of supplies (cloathing and food) for the longer cruises we like to do. At least once a summer we've gone away on 8-9 night cruises. We would even like to do longer but after that many nights, I'm ready to run screaming from the boat. Just too small. You know how much I love the 41PC, but with your size family you may want to look at �bigger� 40+ expresses. 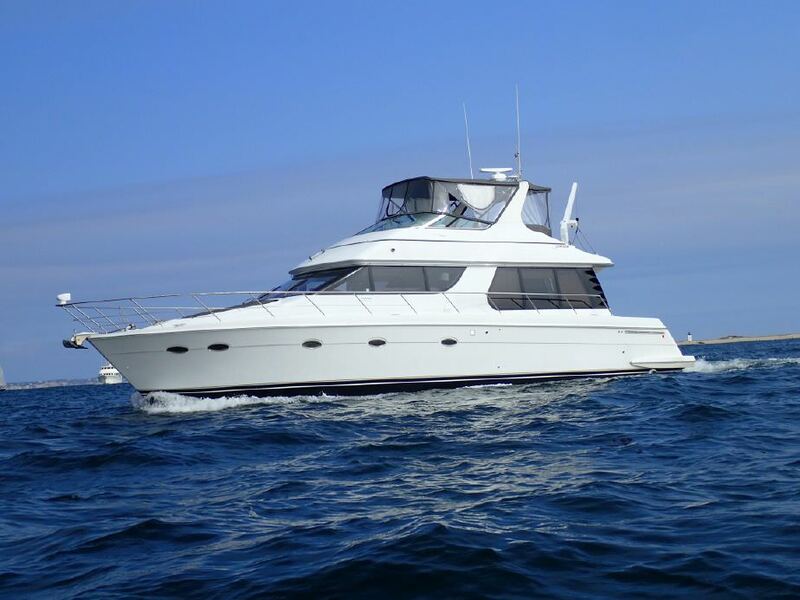 The Late 90�s Trojan 44 express is a killer boat, built very well and a monster size express- for 6 people the 2 heads will be a godsend. There are a lot of happy owners of this boat on Boatered. I have looked at all of those boats (on yachtworld at least). I also have some slip limitations. 40-42 feet is the max. I think the Trojan would be too big although I do like it. I have followed the many Trojan related posts of late. Not a SeaRay fan. The circa 2000 40 dancer is okay and there are a ton of them for sale. Don't really like the Cruisers due to the cored hull but still a nice boat. Neither the SeaRay or Cruisers appeal to me from the "rugged ride" standpoint. The two head thing is really not a big deal to me. In fact, would rather have less to deal with/maintain. I know the 41pc is not the roomiest in it's size but I like the rugged construction and the rep for ride. And compared to my boat it would probably seem like the queen mary! Another candidate is a Tiara 4000 express. Another "built like a tank" boat. My price range would be the early ones 94' to 96' if I could get a deal. Just fewer available and mostly in FL. 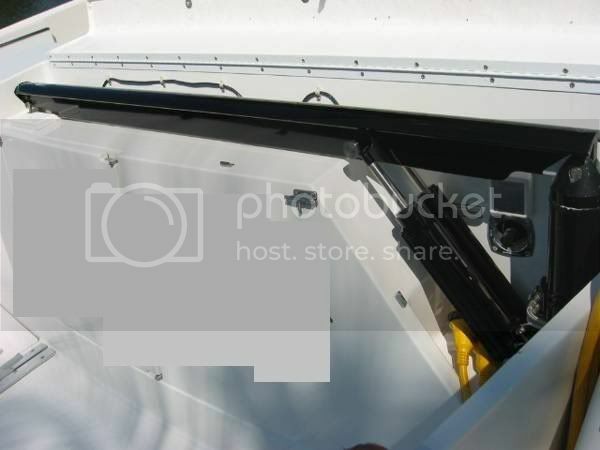 41 PC questions: I seen one with an integrated hoist build-into the transom was this factory option? Also what is the different between a standard Cummins and a diamond series? The hydraulic swim platform pwc lift was/is a factory option. I believe the poster is asking about the davit hoist built into the transom of 1996-2003 41pc's. I know later models had a hydraulic swim platform option but I don't believe the above model did. Abalmuth, you answered my hoist question and thanks for the offer, I'll let you know. BTW, how was the ease of operation? So all Cummins powered 41 PCs have the Diamond Series? At first sight it looks like the pivot point is too wide. I�m thinking you had to increase the height of the hoist to move the pivot point closer to center. Correct?